Surnames evolve over both time and distance, and change usually at the whim of an administrator who simply records an unfamiliar surname as he hears it. In this manner similar sounding surnames which may have appeared in very different geographical locations become virtually indistinguishable from one another. The surname Ferris is a prime example. Today’s global male Ferris population is quite diverse and although sharing a common surname their paternal ancestral journeys may have been very different. 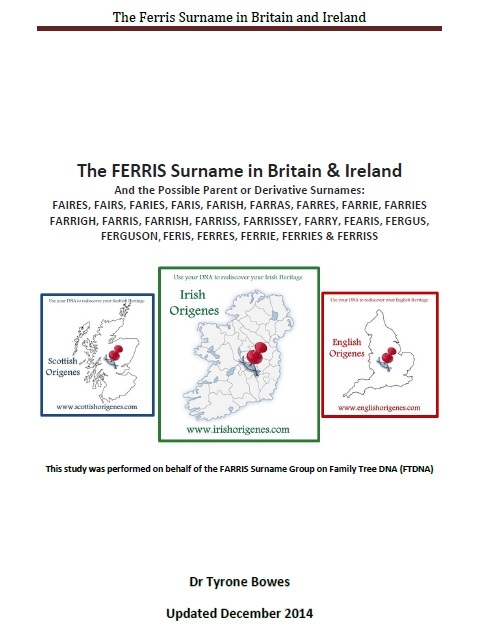 The Farris DNA study group at Family Tree DNA covers an assortment of surnames including Faires, Fairs, Faries, Faris, Farish, Farras, Farres, Farrie, Farries, Farrigh, Farris, Farrish, Farriss, Farrissey, Farry, Fearis, Fergus, Ferguson, Feris, Ferres, Ferrie, Ferries and Ferriss; all of which over time and distance may have contributed to the Ferris surname. The Farris DNA study group at Family Tree DNA commissioned me to do two studies. The first study examined the distribution of the Ferris surname and all possible variants throughout Britain and Ireland. The full report which can downloaded and studied by clicking here identified 5 English, 3 Scottish and possibly 7 distinct Irish groups that have contributed to the worldwide Ferris population. Crucially, If your surname is Ferris (or one of its possible variants) then commercial ancestral Y-DNA testing can determine which of these 15 distinct groups you are directly descended from. That is because each Ferris group will have its own distinct ‘fingerprint’ of genetically matching surnames. For example people with English Ferris ancestry will have genetic matches to people with English surnames, while Scottish Ferris will match Scottish surnames and Irish Ferris will match Irish surnames. 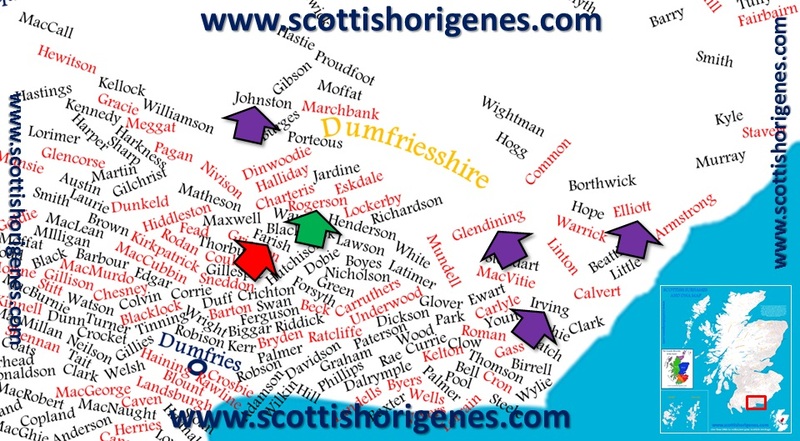 But one can take this process a step further; within Scotland those with Aberdeenshire-Ferris paternal ancestral ties will (upon Y-DNA testing) match people with surnames associated with Northeast Scotland, in stark contrast to Dumfriesshire Ferris who will match people with surnames associated with the far southwest of Scotland. The second study aimed to give a practical demonstration of this analytical process. 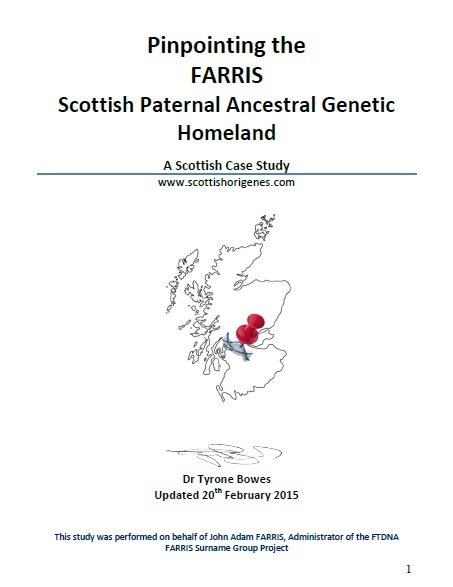 The Farris Y-DNA Case Study which can be downloaded and studied by clicking here clearly demonstrated the pinpointing process and identified where the test subject’s direct male ancestor lived when he first inherited his Farish surname an estimated 1000 years ago. If you would like to commission a Surname Study for your Y-DNA project or would like a FREE CONSULTATION on your DNA results then contact me here or email; tyronebowes@gmail.com. John Farris the Administrator of the Farris Surname DNA Study group can be contacted here.